Margate War Memorial was unveiled on Sunday, 5th November 1922. The memorial has over 400 WWI names inscribed on it in alphabetical order showing only their surname and initials. It seems that a detailed listing of the men who lost their lives in the Great War (as it was originally known) was never produced although local printers and publishers Messrs Lane, Gentry & Co did announce in 1919 that they ‘hope to issue shortly a Memorial List of the Margate men who fell in the Great War’. Despite many enquiries over many years, no copy of such a Memorial List has been located by the compiler and it would seem probable that Messrs Lane, Gentry & Co abandoned their plans. The Margate War Shrine had been in existence at Margate Town Hall from April 1917 listing the names of the war dead as the news came through. That War Shrine would have provided a basis for a Memorial List but, unfortunately, there were - and still are - a number of errors on it which would have made the task of producing a Memorial List most difficult. It was over twenty years ago that I started my quest to find out more about each of the men listed on Margate War Memorial. Over the years, prior to that, I had attended a number of the ceremonies held on Remembrance Sunday at Margate War Memorial. Each time, during the service, the mantra “We will remember them” was repeated yet the reality was that, over the years, the names had become - for many people - nothing more than names on the war memorial. Whilst collectively they were remembered each year, as individuals their deeds and sacrifice had become largely forgotten. In those days, it was possible to identify a number of local family names (such as Hatfeild and Friend) on the war memorial without any difficulty. However, the vast majority of the names were more of a challenge to research. Of course, local newspapers published during the war were helpful but, so huge in number were the losses, it proved simply too much for the newspapers of the day to keep up with the never-ending list of those killed and of those wounded in action. Today, of course, each death would be reported by the local press in detail but that simply did not happen during, in particular, the Great War (later to become known as the First World War or WWI). During my research, I discovered a number of names inscribed on the memorials which did not appear on the CWGC Debt of Honour Register. I am pleased to report that I was successful in persuading the CWGC to add two such names to their records: both names are inscribed on Margate War Memorial. The first was that of John Devereux who lost his life on 11th November 1914 when he was washed overboard during rough weather in the Dover Strait whilst serving as a Warrant Officer on HM Torpedo Boat 117. It would seem that his death was treated as an accident and not as a war casualty. I am pleased to report that arrangements are in hand for his name to be added by the CWGC to Chatham Naval Memorial. The second was John Pulleng who died in 1920 aged 45 having served as a Pioneer with the Army Postal Office Corps in the Great War. I am pleased to report that the Ministry of Defence accepted that his death was war-related and that his name too has been added to their records. It is most gratifying to report that the CWGC have recently erected a small stone plaque at the foot of John Pulleng's grave in Margate Cemetery recording his service details. There are some other names that are listed on the memorial which appear not to be included on the CWGC Debt of Honour Register but, despite extensive enquiries, I have been unable to determine any information about them. It is almost certain that some of those names are simply shown incorrectly on the memorial. I also discovered that the names H. G. Pettman and C. H. Davison, which are both shown on the war memorial, relate to the same man. He first served in the Royal Navy under the Davison alias and that name is inscribed on Chatham Naval Memorial. I drew his Pettman family name to the attention of the CWGC which now shows his two names on their Debt of Honour Register for which I am most grateful. The unravelling of this story was not made any easier by his surname being shown on Margate War Shrine as Davidson! After the Second World War, Frank Sidnell - the Town Clerk of the Borough of Margate - compiled the list of names eligible to be included on the Second World War panels that were to be added to the respective three civic war memorials. The next-of-kin of each serviceman’s name was asked to decide on which of the three memorials they wanted their loved one’s name to be inscribed. 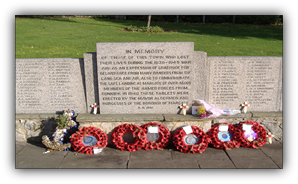 However, it was decreed that the names of all civilians who lost their lives in the Second World War would be inscribed on Margate War Memorial. It is hoped that the Rolls of Honour on these webpages will ensure that the names of those who lost their lives in conflict during the 20th century are remembered as fellow human beings: that each one had a family and that each one was part of the local community. Many of them answered the call for volunteers at the hour of need. Each man named on the memorials made the supreme sacrifice and the community should remember with pride what each of them gave up for their country. When one looks through these Rolls of Honour, it is the young ages of the casualties that strikes home. How local communities were able to carry on at the end of both world wars is a testimony to the human spirit. Let us hope that, never again, are such losses borne by the people of our area - or any other area. I could not have completed this project without help from others. I would particularly thank my wife, Susan, without whose assistance, encouragement and support for this project over the last twenty years were invaluable to me. In addition, I would like to thank both Miss Maria Choules and Ms Nan Wilsdon at the Commonwealth War Grave Commission offices at Maidenhead for their kind assistance; the late Penny Ward of Margate Library Local Studies; Margate Museum for allowing me access to their archive and particularly to their bound copies of local newspapers from 1914 to the early-1920s; Miss Jennie Burgess, Birchington Parish Archivist; Dr Dawn Crouch, Curator of Westgate Heritage Centre; and Mike Wilton for both his support of my project and for putting my work on to the Society’s website. Many others also helped me: they know who they are and that, without their assistance, the results would not be what they are. Inevitably, in compiling information from a variety of sources, a number of errors in the published information will result. Other errors are also inevitable in a work of this nature and for those I take responsibility. If any reader is aware of any errors, would they please contact the Society in order that they may be included in any updating of these Rolls of Honour.